Filipina of the Batan Islands with grass hood. Home » Filipina of the Batan Islands with grass hood. The Batan Islands are an archipelago of the Philippines. They are located north of the Philippine main island of Luzon in the Strait of Luzon and belong to the province of Cagayan. 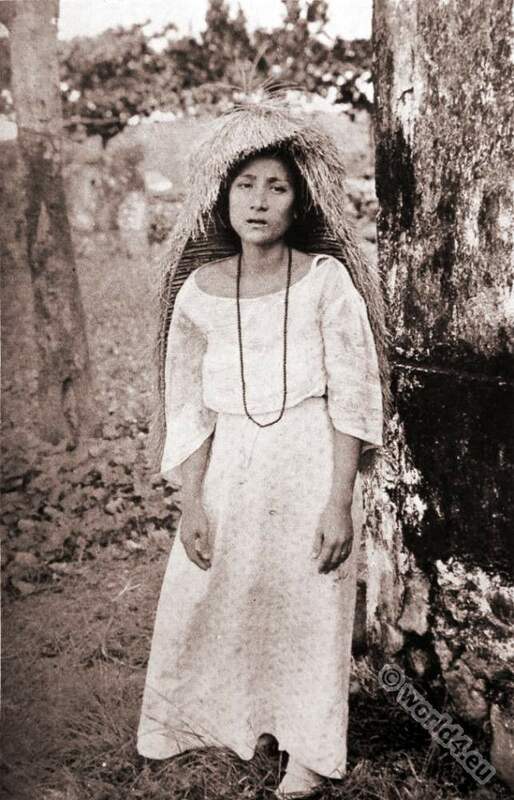 Source: The Spell Of The Hawaiian Islands And The Philippines; being an account of the historical and political conditions of our Pacific possessions, together with descriptions of the natural charm and beauty of the countries and the strange and interesting customs of their peoples by Isabel Anderson, 1876-1948. Published by The Page Company – Boston, 1916. This entry was posted in 10s, 1916, 20th Century, Oceania, Philippines and tagged Philippines tradional costumes, The Spell Of The Hawaiian Islands on 1/15/16 by world4.